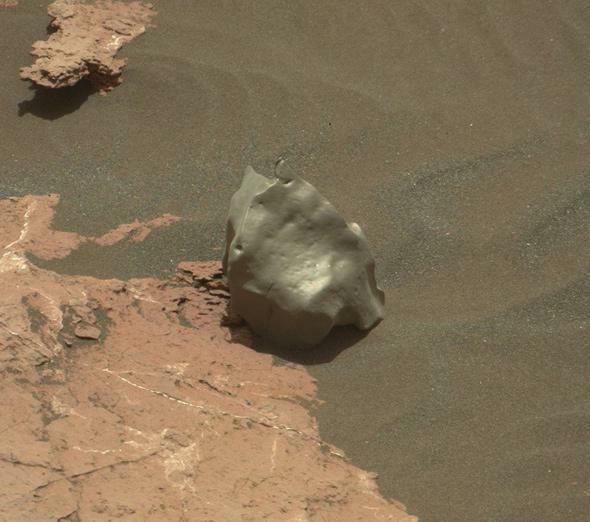 Curiosity sees a meteorite on the surface of Mars. The Curiosity rover has been on Mars since Aug. 6, 2012. In the more than four years it’s been there, it’s seen wonders beyond our Earthly reckoning: evidence of ancient flowing water, evidence of ancient standing water, methane in the atmosphere now, carbon in the rocks, dark basaltic sand dunes, weird lumpy moons circling a dusty red planet. Mars is indeed an alien world. But even with all that, sometimes Curiosity still manages to find things on Mars that are able to surprise and delight: The photo above shows a meteorite sitting on the planet’s surface. The picture was taken on Jan. 12—the 1,577th Martian day, or “sol,” after Curiosity landed—when the rover was investigating sedimentary rocks in the Murray Formation, a large deposit along the flanks of Aeolis Mons (also called Mount Sharp), which itself is the central peak in Gale Crater. Since landing, Curiosity has been inside Gale Crater, heading toward that central mountain. The meteorite sticks out like a sore thumb among the rust-colored rocks and darker wind-blown sand. The shape and color just scream “I’m not originally from here!”—just compare it with the mudstone to the upper left, or the flatter rock below it. It’s hard to say exactly, but it’s likely a few centimeters across, perhaps the size of the palm of your hand. I collect meteorites and have read quite a bit about them, and to my eye this is obviously a metallic nickel-iron specimen. I have some on my bookshelf that look quite a bit like this! On Earth, meteorites like this one start out as a larger chunk of metal asteroid orbiting the Sun. If it has the bad (for them, good for us!) luck of slamming into our atmosphere at hundreds of thousands of kilometers per hour, the intense pressure fiercely heats the air ahead of it, melting its exterior and causing it and the air to glow. A bigger asteroid (say, the size of an easy chair or a bus) can actually explode as the pressure flattens and disrupts it, sending hundreds or thousands of smaller pieces outward. They can form all kinds of weird, bizarre shapes, folded, twisted and pitted from the huge forces at play. The atmosphere of Mars is much thinner than Earth’s but is still thick enough to affect an incoming asteroid in similar ways. I don’t know if this meteorite was part of a larger piece or came in on its own, but the sharp edges and odd surface features betray its extramartian origins. 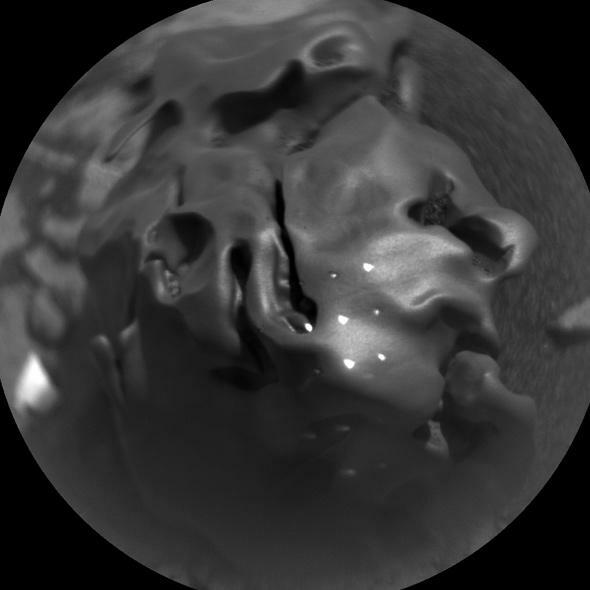 The ChemCam close-up of the meteorite shows the weird folds and contours caused by its atmospheric passage, and the bright, reflective zap marks of the high-powered laser. I’m almost positive this is metallic; stony meteorites tend to look more like, well, rocks. This is clearly more like sculpted metal. The only way to be sure is to get spectra of it … which Curiosity can do! The ChemCam detector was designed specifically to be used for this. It has a high-powered laser it uses to zap rock samples, heating them very rapidly. The vaporized rock emits light that can be broken up into individual colors; different elements in the sample can then be determined by the different colors of light they emit. In the ChemCam Remote MicroImager photo above, you can see the odd shape of the meteorite, as well as several small, evenly spaced shiny features. Those are laser zap marks! ChemCam took spectra of the meteorite, so hopefully we’ll find out what it’s made of. Unfortunately the actual data won’t be made public for some time, but I’d bet the value of that meteorite* that they’ll find it’s mostly iron and nickel (and maybe cobalt); those are the main constituents of metallic meteorites here on Earth. I’ll note that meteorites have been seen on the Martian surface before by both of the Spirit and Opportunity rovers, and have even been used to examine surface conditions on Mars now and in the past. So there’s scientific value in this. These specimens also tell us about the conditions in the asteroid belt, so this is extra science for free. Not only that, but the shape and structure of meteorites might be helpful in understanding what happens to objects as they fall through Mars’ atmosphere at high speed, which has some value as well; after all, that’s how we get our own hardware down to the surface (though meteoroids tend to be moving more rapidly than spacecraft). Also, it’s just really, really cool. I have to admit, seeing this photo is odd. My first reaction was to think, “Whoa! A meteorite! How weird!” How silly is that? After all, these are close up pictures of the surface of another world. Is this not enough for my science-drenched brain to fill it to capacity with wonder? Apparently not. There is still room to be awed, and I’m OK with that. My thanks to RidingWithRobots for the original tweet about this, and to planetary scientist Ray Francis for the ChemCam photo link. *The price for nice metallic meteorites varies a lot but tends to be around a few dollars a gram. Ones from “known falls”—where the meteor event was seen—are more valuable. Given that this one is on freaking Mars its value is beyond price.